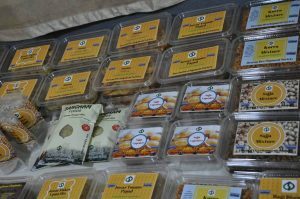 It’s our pleasure to share with you all a very special never before seen of a range of Millet Smart Eats from DDS Sangham Organics, a rural women led ecological enterprise. The Media Meet is on Monday, October 1, 2018 at Press club, Somajiguda, Hyderabad from 11 am to 12 noon. We hope you attend the meet to taste, to speak to the women who prepares, Nutritionist who monitors the preparation of Millet savories, sweets, breakfast foods, spice powders etc., which are the perfect blend of taste, health and nutrition in your esteemed media. We hope you taste, to speak to the women who prepares, Nutritionist who monitors the preparation of Millet savories, sweets, breakfast foods, spice powders etc., which are the perfect blend of taste, health and nutrition. National Award winning All India Millet Sisters Network (AIMS) sisters from over 12 states of India met last week at Meghalaya and had significant discussions on the future of millet and women engaged in millet production. 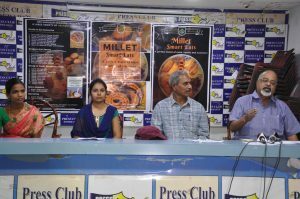 At this historic juncture when India has declared this year as the National Year of Millets and has called upon the United Nations to observe an International Year of Millets this First All India Convention of Millet Sisters has deliberated on Current situation, concerns and challenges of millet farmers. This has thrown up a number of important recommendations and observations. Millet Sisters Symbolize Nari Shakti! With great pleasure we inform you that All India Millet Sisters Network (AIMS) has been awarded the Nari Shakti Puraskar, 2017 by the Government of India for outstanding contribution to women’s empowerment. The award was presented by the President of India in a prestigious ceremony at Rashtrapati Bhawan, New Delhi on the 8th March 2018 on the occasion of International Women’s Day. MINI entered into the new phase with SWALLOWS from 2017. 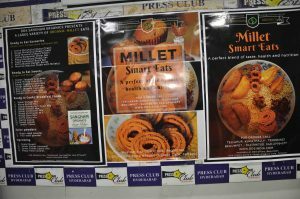 Till now MINI and the partners promoted millets and worked on campaign and awareness of millets. Now in MINI is working to meet the demand for millets in the market and trying to make these wonder grains available to the common people. In this process we are giving training to the millet sister to add value to the millets in order to reach the market with their value added millet products. Jai Chandiram Memorial Community Media Film Festival is a celebration of Community Media which has tried to erase the media hegemony of the urban people over the media. It’s also a statement that local communities in rural India can stop being consumers of media and start being producers. Union Agriculture and Farmers Welfare Minister, Shri Radha Mohan Singh inaugurated the four day Pandit Deen Dayal Upadhyay Krishi Unnati Mela – 2016, in Mathura, on 26 September 2016.
and Tamil Nadu who vividly described the millet situation in their states and they made the following declaration. We the farmers, scientists, nutritionists, environmentalists, academicians and civil society activists concerned about millets belonging to several regions of India – from the hills of Himachal Pradesh to the plains of Deccan, from the adivasi areas of Madhya Pradesh to the mountains of Nagaland– have met at Hyderabad in Telangana on November 25 & 26, 2015 to discuss the various facets, strengths and problems of millet cultivation and consumption in India.